My last post told of my initial training program and reflections on how it worked for me. At the end, I mentioned that Marathon Rookie didn't work on speed, and that brings me to my next (and current) step in training plans - Hal Higdon. I'm a slow runner and tend to have a mental block to pushing myself and letting myself feel very out of breath. That probably sounds odd, but it's the way my brain likes to work. I'm good at long, aerobic runs and chatting along the way if I'm with someone, and I truly enjoy the long, aerobic runs. That said, sometimes I feel too slow and don't like to share my times with everyone. I went with the Hal Higdon plans partly because of recommendations from running friends and partly because I liked the addition of interval work that it outlined. For the Pittsburgh Half Marathon in May 2010, Kevin and I followed the Intermediate half marathon program. It looks like this. We did a great job of following this, adding track workouts for the 400 m intervals and doing either a tempo or Fartlek the other days. We used the University of Michigan track, which is open to the public after 7 pm. Sometimes it was dark, but the area is well-lit. We swapped Saturday and Sunday because we prefer to long run on Saturdays; on Sunday we did an easy run as recovery. The biggest change with this schedule was running 5 days instead of 4 days per week and I noticed the difference on my body. One important thing I did at the beginning of 2010 was begin a regular strength training program with a group of people at work. This opened my eyes to how essential strength and stretching is to running. I should have known this, but before I always felt like I had to run to train and didn't like to switch out those workouts for something else. In this case, I added additional workouts but later in the year subbed a run for an extra strength session. Running 4 days really works best for me. Race morning in Pittsburgh was hot and humid, and it started raining hard around mile 2. At that point the rain felt great and thankfully cooled it down a little. The course was hilly, and at the time it felt harder to me than SF but I'm not sure that it really is. The worst hills were going up an on-ramp to a bridge and then the long hill at mile 10. I enjoyed running through Pittsburgh and over the bridges with nice views of the rivers. I felt pretty tired at mile 11 after that last hill but we finished strong (not to mention drenched!) in 2:21:33. My previous half PR from Detroit was 2:26:05. 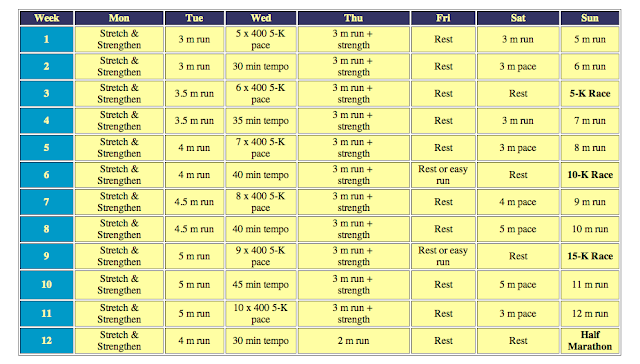 We continued using the Hal Higdon plan to train for the 2010 Chicago Marathon, specifically the Novice 2 program. 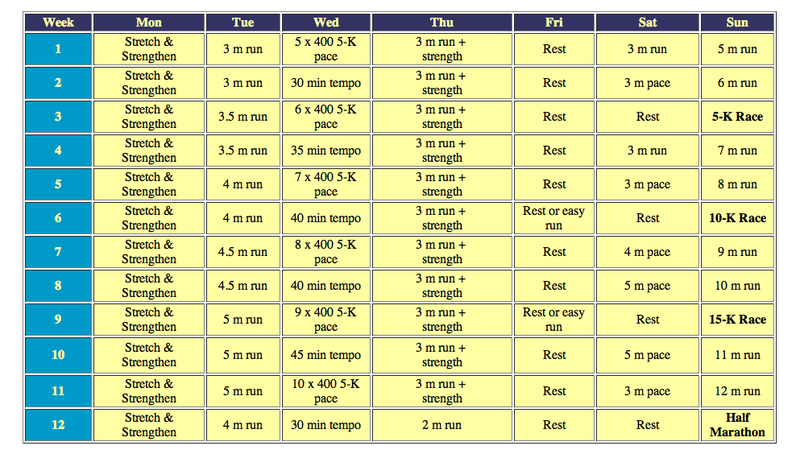 These plans are still my go-to training schedules and I don't see myself switching anytime soon. I even got to meet Hal Higdon at the Chicago Marathon expo and said thank you in person! Between the strength and stretching programs and adding speed work, I got the results I wanted. I didn't speed up a ton, but I definitely felt more comfortable running and shaved a few minutes off of my half PR. Adding biking and swimming to my repertoire last summer had even better results - not to mention it was fun changing it up, meeting new people in the bike group, and trying something new. My current half PR is from Salinas Valley in August 2011 at 2:10:39, and I believe I owe this at least in part to the hard interval workouts on the bike with Integrate Performance Fitness. Hopefully I can continue this trend next spring!